To celebrate the first day of this years Bike to Work Week, I made the trek up to the most northerly celebration station in south Sidney. Today’s big story ended up being the weather, with a little bit of rain, sun and just about everything in between. 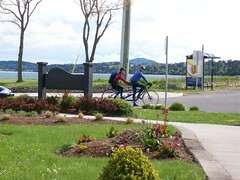 We were right along the water near the Anacortes ferry terminal. This meant there was a very stiff breeze from the south, so much so that at several points the half dozen of us all had to hold down the tent to literally keep it from blowing away. I ended up staying just over an hour and in that time we saw about a half dozen bicyclists. 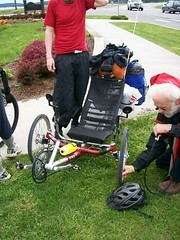 Amongst that group was a recumbent, who along with his partner, were on their way to Tijuana and a tandem heading south. I am not certain if it was the distance or the cold weather but every cyclist we had come was seriously equipped. Hopefully we get some better weather over the next few days to get those occasional riders out. See you all tomorrow at the UVic fountain between 6:45 am and 8:45am. Today marks the first day of the annual Bike to Work Week. This years is two weeks early, to coincide with events across North America. 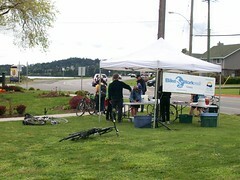 The kick off this morning at the south end of the Selkirk Trestle. 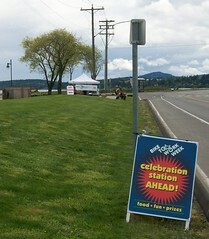 That was only the first of a whole host of celebration stations across the city over the next week. There are lots of other stations. Check out the complete schedule (PDF). I am hoping to get to a few more, just to talk with people and get inspired. Happy Bike to Work Week everybody! Quick note about the map: It is from the , a user-editable map of the world. Although the map is incomplete, the Canadian government with its Geobase project has released much of its data under a free license and this is now being imported into OSM. Why is free data important? It allows different views of the map, such as the cycle-specific version embedded above, which shows bike routes, parking and lanes. Sadly Geobase lacks any of this bike-specific data butyou can help.